Beautiful bag in a neutral taupe with amber pyramid stones on the front flap in the Imoshion Nikki Handbag. 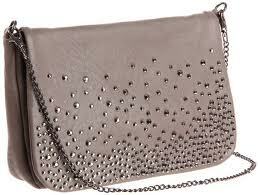 Three different weaves on the chain strap can be removed to use as a clutch. Inside zip pocket and two interior cell phone pockets.